SYNOPSIS: Irwin S. Lerner was aboard a B52 shot down by a Surface to Air (SAM) missile over Hanoi on December 20, 1972. His B52 was one of many involved in the successful "Christmas Bombings" of Hanoi that finally convinced the Vietnamese to sit at the peace table. There were a total of 12 men missing in close proximity to each other from B52 aircraft on December 20. It is unclear which men were together on any given plane, although it seems clear that the four missing were on the same plane as Madden and Martini, as Defense Department notes that two men were released from Lerner and Perry's plane. The total number listed exceeds a normal B52 crew capacity, which is six. Lerner's craft was third in a flight of three B52s over Hanoi that day. The fate of all three planes is uncertain. Chief Master Sergeant Arthur V. McLaughlin, Jr., Gunner. One thing that amazed analysts about the B52 bombers that were shot down over Hanoi during this period was the high survival rate of the crewmembers. Many more were returned as POWs than was expected. The B52s that were shot down were downed in extremely hostile territory with little or no chance of rescue. Major Irwin S. Lerner, a Stratford, Connecticut, native, was laid to rest with full honors Friday under a cold, cloudless blue sky at Arlington National Cemetery, 31 years after he died in the Vietnam War. Lerner, an electronics warfare officer with the 307th Strategic Wing, was aboard a B-52 bomber shot down over Hanoi on December 20, 1972. His remains were only recently identified using new DNA techniques. The ceremony began at 11 a.m. when a B-52 aircraft from the 93rd Bomb Squadron at Barksdale Air Force Base in Louisiana flew overhead. Lerner's flag-draped casket was carried along a tree-lined road to the gravesite on a black artillery caisson pulled by six white horses. About 50 mourners, including Lerner's three children and four grandchildren, bundled against a steady bone-chilling wind, followed the caisson and an Air Force honor guard up the road to the gravesite. Lerner's gravesite, within sight of the Pentagon and Washington Monument across the Potomac River, is next to the site where his wife, Roberta Reilly Lerner, is buried. She died, never having remarried, in 1995. Eight U.S. Air Force Honor Guard pallbearers carried the casket from the caisson to the gravesite where Rabbi Marvin Bash delivered a brief service in English and Hebrew. Lerner's three children, Mark, 38; David, 36; and Jennifer Clary, 32, who now live near Atlanta, sat by the gravesite. David's daughters, Mary, 6, and Holly, 8, sat on their laps. Behind them were other family members as well as two Connecticut couples who were friends with Lerner, Jim and Pauline Simon of Stratford and Jim and Connie Buchta of Norwalk. Following Bash's words, a seven-member firing party, dressed in Air Force blue overcoats, fired three volleys and a lone bugler played Taps. Brigadier General David E. Clary presented a folded American flag to Mark Lerner and offered his condolences on behalf of the Air Force and a grateful nation. Included in the flag case were Lerner's nametag, wings and medals. "It was very emotional," said eldest son Mark. "We have closure." A banker in Atlanta, Mark Lerner said his family was grateful to the Air Force for the military honors and to members of the Jewish War Veterans of the U.S.A. and Rolling Thunder who attended the ceremony. "I was very pleased with the service the salute, Taps, the honor guard, the flyover and the caisson they all were very impressive," Mark Lerner said. Simon, a boyhood friend of Lerner, said the ceremony was "absolutely beautiful. "It is so impressive and sad," Simon said. During the ceremony Simon said he kept thinking about the promise he had made to Lerner's father years before to remember his son and keep the MIA issue alive. Simon, 63, said Lerner's father, Eli Lerner, kept him informed about Lerner's tour when they worked together as machinists. Simon said Eli Lerner, who died years ago, never gave up on seeing his son again. In 1985, Simon saw to it that Lerner's name was added to Stratford's Vietnam veteran's memorial at Academy Hill. "I said I wouldn't forget and I didn't," Simon said. Lerner was on a mission during what became known as the "Christmas bombings" of Hanoi. The intense fight convinced the Vietnamese to sit at the peace table. A total of 12 men were reported missing near each other from three B-52 aircraft shot down during the December 20 mission. It is unclear which men were together, but two, reportedly from the same aircraft Lerner was in, later were reported as prisoners of war. The other four on board, including Lerner, 31, were not found. In 1978, his status was administratively changed by the Air Force from missing in action to "killed in action, body not recovered." In November, a Hawaiian lab was able to confirm that remains recovered in 1985 from an excavated crash site in North Vietnam were those of Major Lerner. The lab used DNA samples found through the help of a genealogist, who tracked down a maternal cousin of Lerner's living in California. After three decades, the military says it has finally identified the remains of a Stratford Air Force officer. Air Force officials say Major Irwin Stuart Lerner's B-52 was shot down with a surface-to-air missile in Hanoi in December, 1972. Military officials thought they found his remains in 1985. But it took nearly two decades to confirm them with D-N-A testing. Lerner left behind a wife and three children when he died. His wife, Roberta, died in 1995. 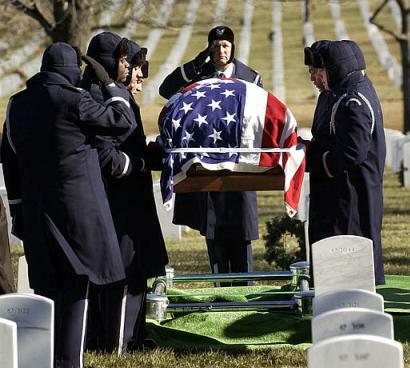 He will be buried in Arlington National Cemetery later this month with full military honors. STRATFORD, Connecticut -- The remains of an officer who died in Vietnam in 1972 have been identified after a three-decade wait. 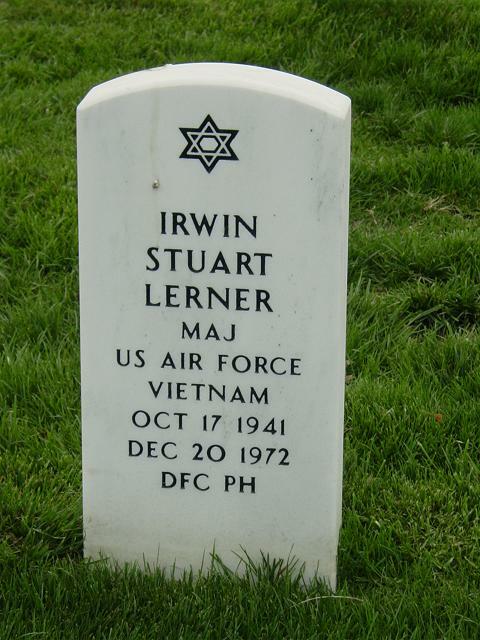 Maj. Irwin Stuart Lerner died in Hanoi on December 20, 1972 when his B-52 was shot down with a surface-to-air missile, Air Force officials said. Military officials believed they had his remains in 1985. But it took two decades to confirm them through DNA testing, said Kathy Shemeley, president of the Prisoner of War/Missing in Action CT Forget-Me-Nots Inc.
"It's important for a family to have closure. A family always wonders what happened to a loved one," Shemeley said. Lerner will be buried this month at Arlington National Cemetery. He was 31 when he died, leaving behind a wife and three children. His wife, Roberta Reilly Lerner, died in 1995. His three children, Mark, 38, David, 36 and Jennifer, 33, live in Georgia, where they moved with their mother once she found out Lerner was missing. "I don't know what it's going to do for me," said Jim Simon, a childhood friend who pushed a plan for a Stratford monument built in Lerner's honor. "When I went to the Vietnam Memorial in Washington and saw his name among the missing, I cried." Simon, 63, said Lerner's father, Eli Lerner, kept him informed about Lerner's tour when they worked together as machinists. Simon said Eli Lerner, who died years ago, never gave up on seeing his son again. "He'd say to me: 'I expect Irwin to walk through that door,"' Simon said. 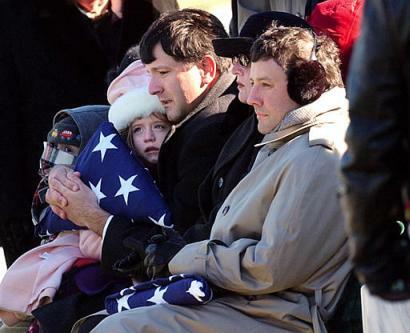 at the casket of Air Force Major Irwin S. Lerner, of Stratford, Connecticut, during his funeral at Arlington National Cemetery, Friday, January 16, 2004. Lerner, daughter Jennifer Clancy, son Mark Lerner, and unidentified children.